If you are looking for something different that is also quick and easy to throw together then this salad is a great option for the warmer months. Haloumi is definitely on trend at the moment and when paired with a fresh salad you have yourself a delicious light meal or an entrée. Our recipe also makes a great partner to grilled fish or chicken fresh off the barbecue. Haloumi cheese is best served immediately, while it is slightly crispy on the outside and soft and gooey on the inside. 1. Make Lemon dressing: Place oil, lemon juice and pepper in a screw-top jar. Secure lid. Shake to combine. 2. Heat half the oil in a non-stick frying pan over medium-high heat. 3. Add half the haloumi. Cook, turning, for 1 to 2 minutes or until golden. Transfer to a plate. Repeat with remaining oil and haloumi. 4. 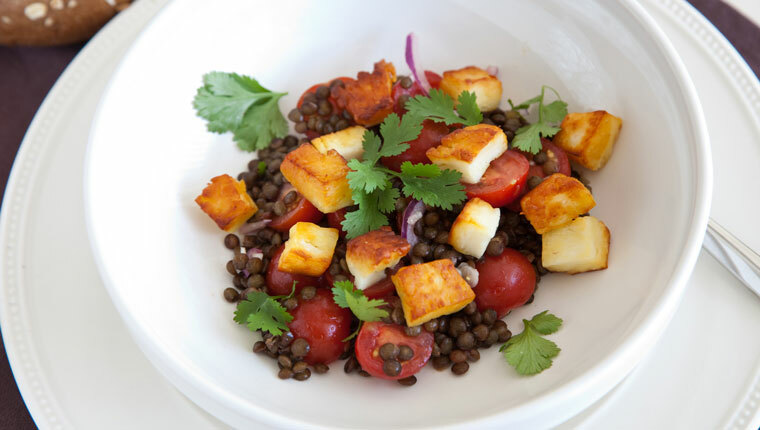 Place lentils, tomato, parsley, celery and haloumi in a bowl. Add dressing. Toss to combine. Serve.